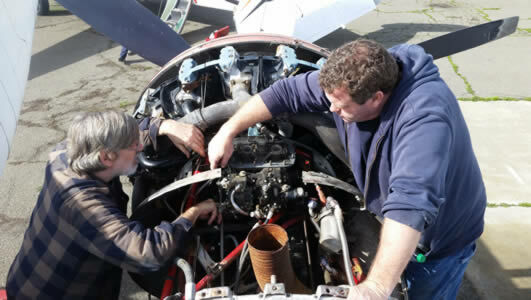 We are a maintenance and restoration shop located at Stockton Airport (SCK) in California. Our shop specializes in the maintenance and restoration of Warbird (ex-military), Antique, and Classic aircraft. As the name of our web site implies, we have a particular fondness for the Twin Beech. The Twin Beech name refers to the Beechcraft model 18 series aircraft. 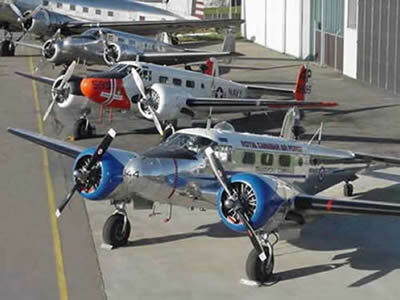 The Beech 18 family includes many different models dating from the late thirties all the way into the mid sixties. 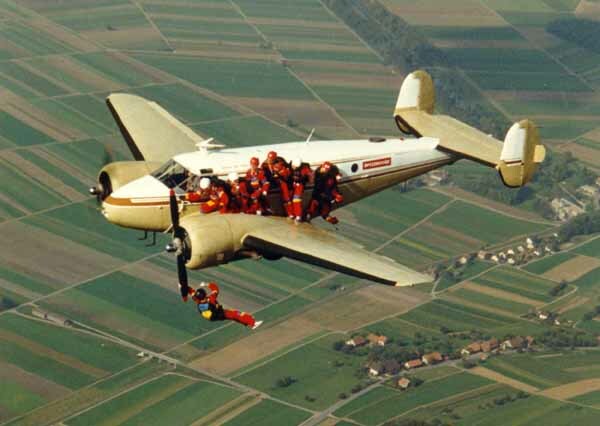 Our shop has a large amount of experience with the Beech 18. 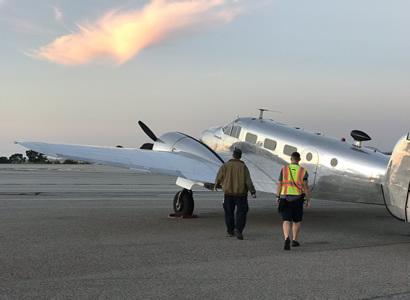 In the future I will be adding other pages to this web site that will discuss maintenance, operations, ground transportation and other important issues concerning the Twin Beech. Scroll down and click on a button for more information. Wing spar strap installation and kits. We own the STC and are the sole provider for the Aerospace wing spar strap kit. For more information about the spar kit that we offer click here. Safe ground transportation on our custom built Beech 18 trailer. For more Beech ground transportation information click here. 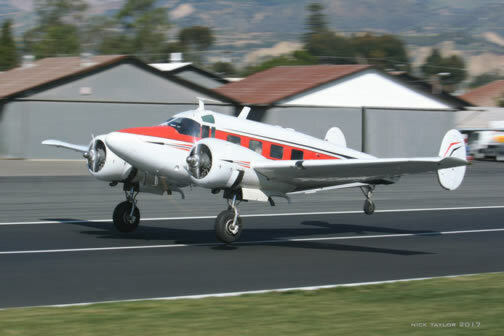 This is our current flier, a Beechcraft E-18S that is currently up for sale. Call us at 209-982-0273 for more information on this wonderful bird! If you are thinking about purchasing a Beech project or a flying aircraft please give me a call first. Or click on the links below for additional information. I will gladly give you a nickels worth of free advise based on what I have learned over the years. The Twin Beech is a great airplane but there are some things to consider before you buy. How are you going to get your new project home? 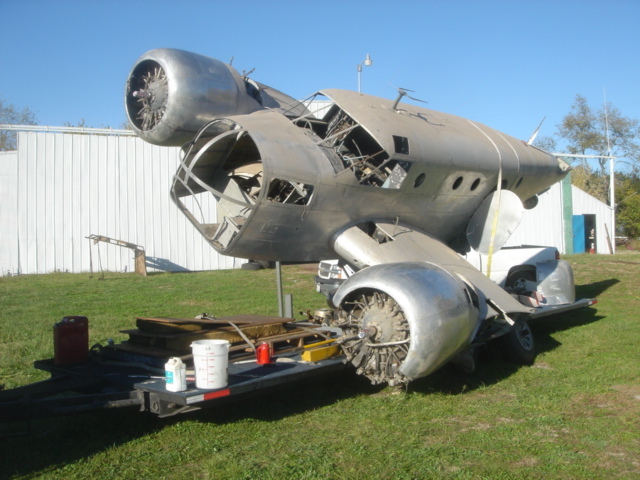 Click here for more information about transporting a Twin Beech on the ground. Before you buy you might want to come out and take a flight and try out a Twin Beech to be sure that this is the aircraft for you. I need to give you fair warning though, I have had many people do this very thing and all it did was set in stone their desire to go ahead and buy one. Thank you for visiting our web site. Please check back as we will be adding new items and updating the old. Your input and advice is always welcome so please write to us and keep sending information and photos so we can help share information about these great aircraft. The latest version of "No frills flight"
See the pictures below for our guys in action! Presently we have three Beech 18's in the shop. The one in the foreground is a D-18S that is being brought into an airworthy condition for its owners. She is a nice D model that is fairly stock and the owners would like her brought back into her original configuration. Just visible on the left is another customers aircraft that is in for an annual. This beautiful 3NM is one of our oldest customer's and she is a real treat to work on. We now have three AT-11 bombardier trainer aircraft at the shop for restoration. The AT-11 in the back ground is a long term project which has her own web page. Click here to check out the progress. 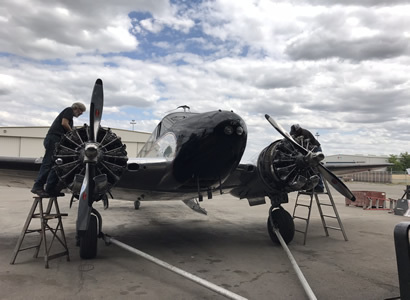 The latest arrival at Vintage Aircraft is an AT-11 project that is only 36 serial numbers away from the other AT-11 that we are building for a customer. This AT-11 is awaiting her turn in the shop for the full ground up treatment. She is a beautiful and stock bird that has very few modifications. Vintage Aircraft is the owner of the STC for the Aerospace Products spar strap kit for all of the Beech model 18's. We are the sole supplier for the best, most streamlined, spar strap for the Beech 18. This is also the only spar strap that is available today. Bob Parmerter's new book all about the Beech 18 is finally here! Check out our announcement page for ordering details by clicking here! Vintage Aircraft is presently restoring an AT-11 project for one of our customers. We have created a new web page which will show this restoration from the beginning to the first flight. Click here to watch the progress. Vintage Aircraft has been chosen to take care of, and operate this beautiful 1944 North American B-25 Mitchell Bomber. She is one of the best B-25's around and it is a great honor to have her here. This wonderful living piece of history is available for air shows so please call or e-mail if you would like us to bring her to your event. I will be posting more information about the B-25 in the future so please check back. The Aerial Gunnery Symposium was the best event that we have had here at the museum to date. I will post pictures and a report soon. One nice article about our symposium in the Stockton Record can be seen by clicking here.